Jorge Lorenzo secured his second MotoGP world championship as he finished second in the Australian GP. Australian Casey Stoner won at Phillip Island for the sixth year in a row, but Repsol Honda team-mate Dani Pedrosa crashed out of the lead. Pedrosa, who needed to finish ahead of fellow Spaniard Lorenzo to keep the title race alive going into the final race of the season, crashed on lap two. Briton Cal Crutchlow claimed third, his second podium finish of the season. Yamaha rider Lorenzo, who first won the title in 2010, started the race with a 23-point advantage over Pedrosa and was as good as handed the title when the latter crashed out. Stoner, who retires at the end of the season, had been dominant from first practice on Friday and was able to cruise to his fifth victory of the season. 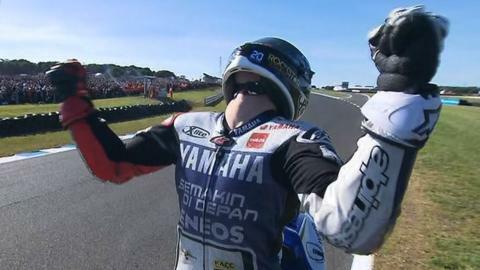 "This moment is so sweet for me," Lorenzo told BBC Sport. "I've been very patient and concentrating hard for so long and now the title has come. "I was nervous in the last few laps. I almost crashed in turn two but I brought it home." Stoner started from pole position but was passed going into the first turn by Lorenzo and Pedrosa. Pedrosa hit the front at turn five and Stoner moved into second at the end of the first lap. The title was all but settled in dramatic fashion as Pedrosa ran wide into Honda corner and lost the front end of his bike. Pedrosa, who attempted to rejoin the race but had to retire, said: "Congratulations to Casey for his sixth win at his home Grand Prix and to Lorenzo because he deserved the championship. "It's a sad feeling more than disappointment. I pushed as hard as I could. Sometimes it goes your way, sometimes it doesn't. "Six wins, 10 second places, 16 podiums and only one retirement - it has been a ridiculous season from Jorge Lorenzo. He is MotoGP champion again and thoroughly deserves it." "I have no regrets for my riding. I feel very proud of my team and of my performance throughout the year." Stoner said: "When I knew I only had a few laps left and a big lead, I was watching the crowd and it was fantastic to see everyone cheering me on. It made me very proud to be Australian. "My biggest congratulations to Jorge. He's ridden an almost perfect season finishing first or second when possible." Earlier, Marc Marquez, who is replacing Stoner at Repsol Honda next year, sealed the Moto2 title with a third-place finish. Pol Espargaro took the race win, with Australian Anthony West second and Briton Scott Redding fourth. New champion Sandro Cortese won the Moto3 race, with British rider Danny Kent in fifth.